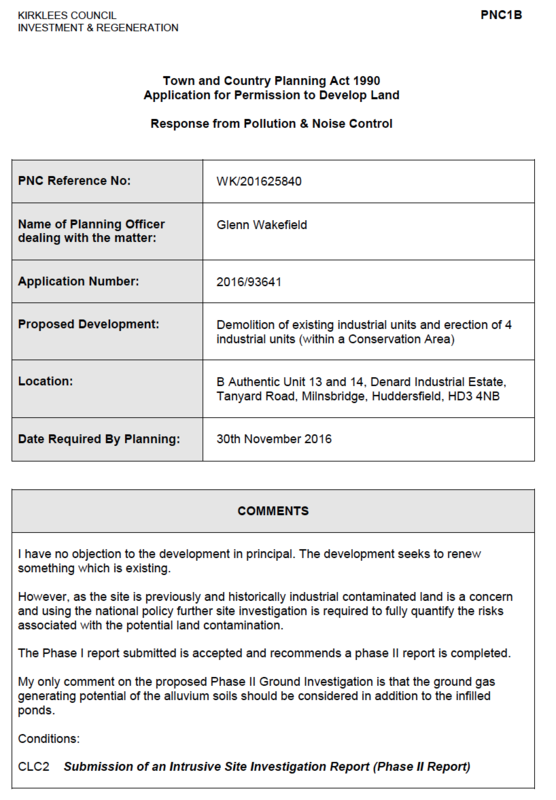 In order to support the planning application for the redevelopment of an industrial estate a Phase I desk study report was required to assess the potential issues relating to historical contamination and previous land uses. Demeter Environmental were commissioned to prepare the desk study report, the stage of which was to review the site history using Ordnance Survey maps dating from 1854 as well as aerial images and street level imagery. The O.S. maps revealed that the site was partly occupied by a building likely associated with the nearby tannery, the site was cleared and redeveloped into an industrial estate in the late 1970’s. 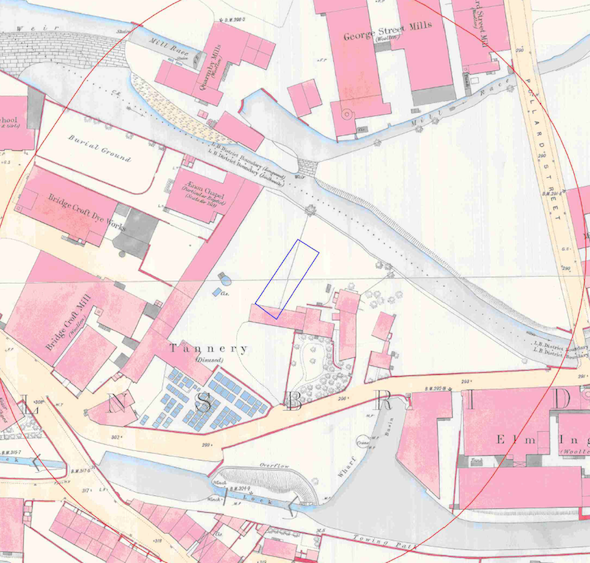 The maps indicated that a number of industries (including a tannery and numerous mills) were present in close proximity ot the site as well as numerous area of in-filled land (former reservoirs etc.). Data provided by Groundsure revealed a number of current industrial uses in close proximity to the site, including a garage and vehicle spare parts. The sensitivity of groundwater and surface water receptors was undertaken based on data obtained from the BGS geological maps as well as the Environment Agency, it was determined the River Colne was a high sensitivity receptor and the groundwater under the site was determined to be of moderate sensitivity. On completion of the desk based review the site was visited and the walkover survey undertaken. 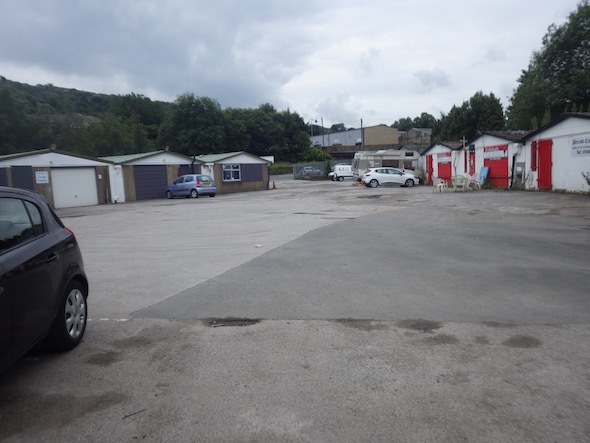 The survey revealed the site comprised of four industrial units, one unit was use for vehicle servicing and the reminder for storage of costumes. A qualitative risk assessment was undertaken on the potential sources of contamination identified in the report, which indicated that the previous site uses a well as the nearby industries and in-filled land within 250m of the site posed a potential risk. Given the low sensitivity of the proposed development the option of remediation assuming a reasonable worst case scenario was given as an alternative to site investigation. 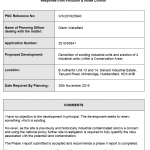 The desk study report was submitted to support the application for the proposed development, the memo accepting the report is online with the planning documents.